What do marketing and a game of pool have in common? Well, in either case, things sometimes go well for you – but at other times they go better for your opponent. The difference is that in a game of pool, it’s easy to see what’s going well and what’s not. In marketing, you can’t necessarily observe and measure interactions, responses and outcomes with the naked eye. Instead, you have to build a solid, defined plan with diagnostic metrics. Learn how USAA (which provides insurance, banking, investment and retirement products and services to US military members and their families) used analytics from SAS to evaluate its marketing efforts and return impressive results. 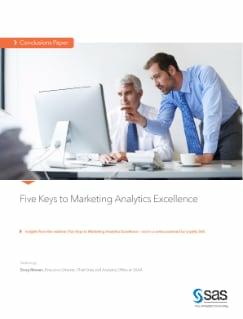 This paper shares insights from the webinar Five Keys to Marketing Analytics Excellence – one in a series powered by Loyalty 360.